You can also shop directly on our Facebook page. We look forward to having you bring our artwork into your home, office, or organization. Our goal is to see our artwork used for building relationships, promoting small business and nonprofits, and inspiring others. Do you operate a small business or nonprofit that is in need of wall art, but you can’t afford to buy art outright? Consider our Art Rental Program. It’s an affordable way for your business, medical office, wellness center, or yoga studio to decorate its walls with high quality art. Choose from stock themes, or talk with us to develop a custom theme. We’ll work with you to match decorative art to your company’s mission and brand. Twelve-month minimum rental period, with first month’s rent paid up front, plus 1-month refundable damage deposit. Shipping/delivery fees may apply. Rent-to-own option available. Option to swap prints once per twelve-month period, to freshen up your decor. See more sample themes in our Office Art Gallery. Contact us to start the conversation. Initial consultation is free. Our card format is a 5×7 white card, with a 4.5×6.5 color image, with standard A-7 white envelope. We specialize in nature images. Cards are blank inside to allow for a handwritten message. Cards start at $3.00 each, plus shipping. Visit our Store on Shopify to place an order or to inquire about creating cards from customized images. This is a very popular style of wall art. The image is printed onto canvas, and wrapped around a wooden frame. It can be hung just as it is. Pricing varies, so Contact Us with the size you are looking for and we will prepare a quote. 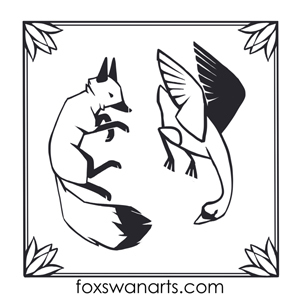 Fox and Swan Arts donates a canvas wrap to Kinstone. This is another popular style of wall art, with a sleek modern look and glossy finish. The image is printed onto sheet aluminum, and outfitted with a hanging mechanism that sets it off the wall to add some depth. Pricing varies, so Contact Us with the size you are looking for and we will prepare a quote.